There are a lot of business card cutters on the market, but if you’re going to get a machine that cuts cards, why limit yourself to a business card sized cut? MBM designed the BC-12 Tabletop Business Card Cutter to give your office some versatility for in-house jobs. It’s perfect for business cards, post cards, digital photos, checks, and more. If you’re mainly interested in the business card function, the BC-12 Tabletop Card Cutter will cut 12 standard size business cards per page (up to 60 cards per minute) – which is pretty fast. However, you’ll also find 10 other pre-set cutting modes and quick-change cartridges to switch out easily (without tools) for different cutting formats. Like other MBM models, this one is quiet and compact. It will soon become your favorite machine in the office. 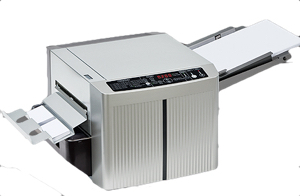 The BC-12 Tabletop Card Cutter lists at $5,999, but you can purchase it at Lloyd’s at $5,399. We’ll throw in free shipping and a gift with your purchase. 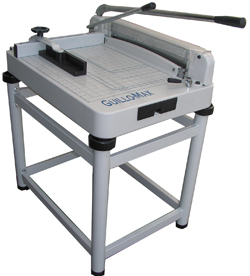 For more information on MBM BC-12 Tabletop Card Cutter or to place an order, please visit the Lloyd’s website.